I had the opportunity to visit Jungle Cat World recently and was blown away by their amazing animals, knowledgeable and welcoming staff and the fantastic opportunities the Wildlife Park has to offer. 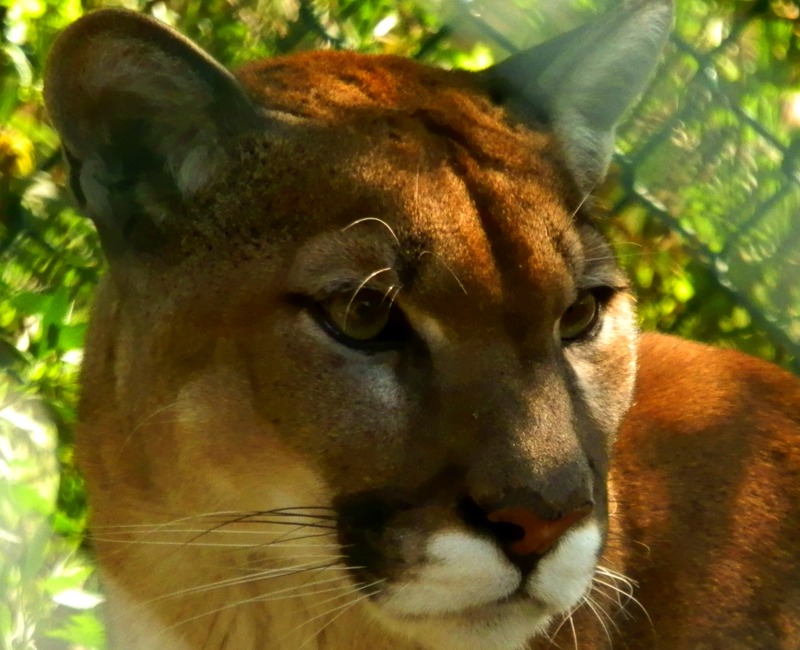 Located 45 minutes east of Toronto in Orono, Ontario, Jungle Cat World is a Wildlife Park set on 15 acres and is home to a wide assortment of animals but are best known for their majestic cats. Established in 1983 with a couple of lions and a tiger, Jungle Cat World has blossomed into a facility that is recognized by CAZA, AZAA, WAZA and their captivating work to educate visitors, children and the general public on wildlife and conservation, as well as for their successful breeding programs for endangered species. They are currently working extensively with the Amur leopard. The Amur leopard is critically endangered and one of the rarest species on the planet today. If you love big cats like lions, leopards and tigers then you’ll love Jungle Cat World, but the park is also home to wolves, which were surprisingly active when I visited, running around and gracing the air waves with their haunting howls, birds like Nodin the red-tailed hawk who I must admit has quite the personality, and primates like lemurs, spider monkeys and a very vocal gibbon – oh how I love their song! I must admit I was immediately taken with the place when I walked in and noticed some llamas lounging at the playground and then saw a few miniature goats taking a stroll through the park as well. The park has these as well as ducks, deer and peacocks roaming the ground freely – it is truly enchanting! Jungle Cat World is home to some of my most favourite of animals from big cats like the playful cougars, of which have the most number of recognized names from mountain lion to puma and catamount to panther, and the illusive snow leopards which are also critically endangered and the park is hoping for a litter of cubs from their pair in the coming years, to hyenas. Hyenas are one of my favourite animals, I find them simply fascinating and sorely misjudged. Jungle Cat World is home to two striped hyenas, the smallest of the hyenas but can erect the hair of its mane to appear 38% larger. One of the big draws is the feeding tour where a keeper guides visitors to a variety of animal exhibits to feed them and talk about the individual animals as well as the species in general. Our keeper was absolutely fantastic! She was knowledgeable, entertaining and passionate about the animals and their wild cousins. I was surprised by how in depth and long it was – an hour and a half. The feeding tour is definitely worth it and a must! 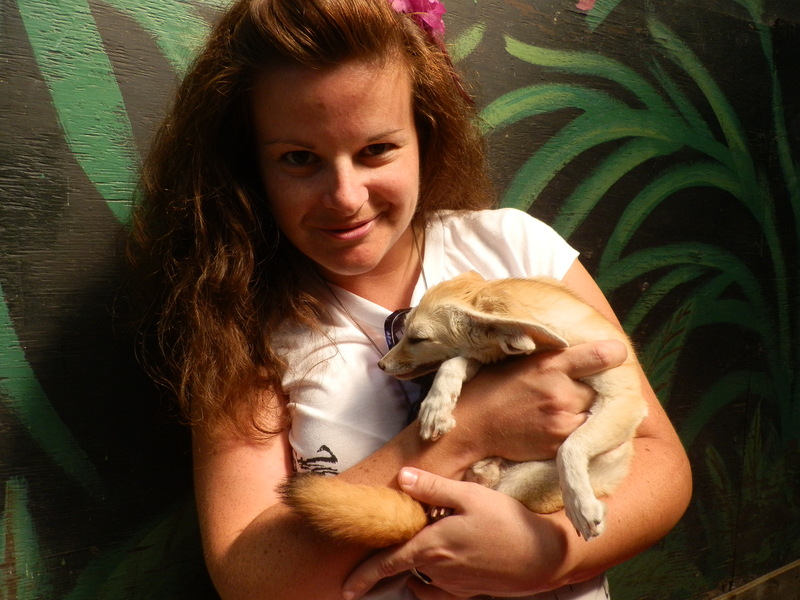 To round out a perfect day I was given a chance to meet the park’s fennec foxes. One of the many animals you can meet on a Behind the scenes tour. 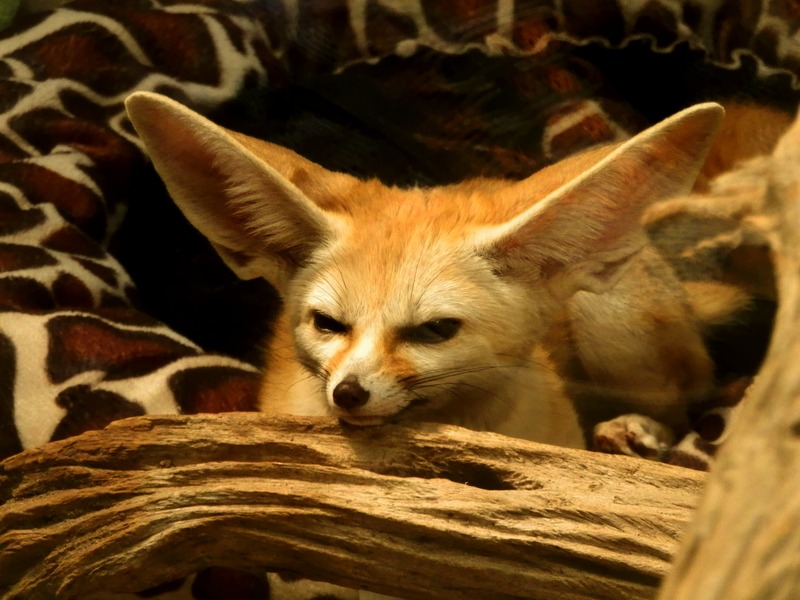 From the deserts of Northern Africa fennec foxes are the smallest of the fox species and have huge ears that can be up to 6 inches – making these cute creatures appear almost cartoonish. 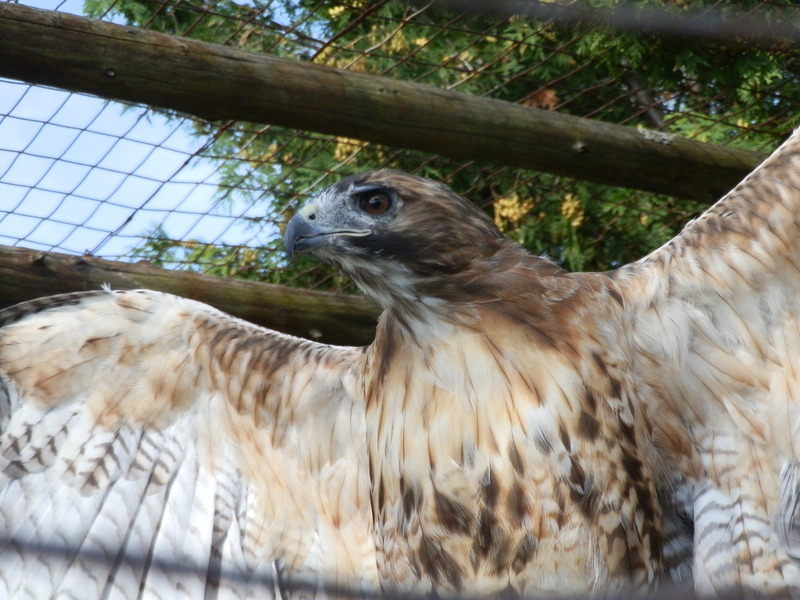 The park has two females and I was thrilled to meet them. It was darling to watch the youngest, 6 months old, play and drag around her toys all the while being very vocal, but as soon as I picked her up and held her in my arms she relaxed and seemed to doze. What a magical experience to meet and have a close encounter with an animal. Like I always stress, it’s experiences like this that brings more awareness and compassion for these animals, how would we learn to care for them if we never met them. I’d like to say a big thanks to Jungle Cat World and its staff for a great day! And I encourage all who have not been, or haven’t in a while to visit! To learn more about the many things you can do at Jungle Cat World, from Behind the Scenes tours to a stay in their Bed & Breakfast and Night Safari, check out my post: For All Your WILD Needs Visit Jungle Cat World. To see more photos of my visit check out Lady of the Zoos on Facebook!